October 23, Fineko/abc.az. 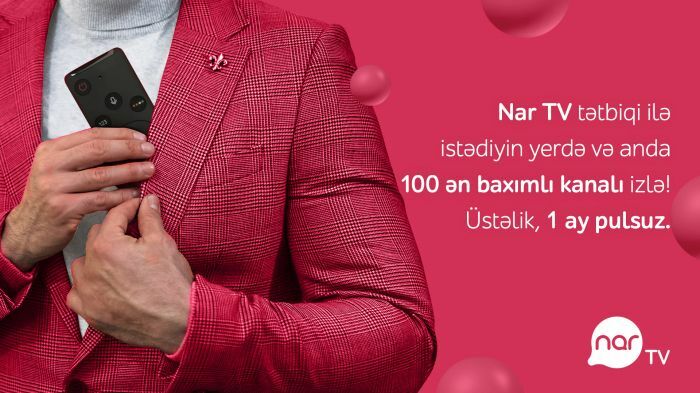 For the first time on telecommunication market of Azerbaijan, Nar presents the Nar TV online TV service. Nar TV application has no time or place limits. From this point forward, the subscribers will be able to conveniently watch their favorite TV channels and broadcasts on their smartphones at any time and place. Nar TV provides access from mobile phones or tablets to up to 100 selected local, regional and international TV channels, including sports, entertainment, children channels, movies and news. By downloading the Nar TV application right now, users will be able to watch up to 100 channels for free during a one month period. Nar TV which provides the subscribers with a possibility to conveniently watch their favorite channels can be downloaded to phones or tablets from Google Play- https://bax.nar.az/nartv-gor App Store - https://bax.nar.az/nartv-i. A Nar number should be used for registration.Other advantages of Nar TV include possibility to watch the missed TV programs during 12 hours. The monthly fee is only 3 AZN. By using Nar’s 4G network, subscribers can get full watching experience. Nar TV also includes the parental control option. Thus, it is possible to apply limitation to certain channels by means of a PIN code. The service is provided in partnership with Uninet.More information about the other advantages of Nar TV is available at nar.az website. “Azerfon” LLC (Nar trademark) started its operations on March 21, 2007, and within a short period of time became one of the leading companies of the telecommunications and mobile communication industry of Azerbaijan. Being the first operator in the country to introduce the 3G technology, Nar provides the customers with a wide 4G network coverage.Within the frames of its strategy aimed at continuous improvement of the network quality, the mobile operator has introduced the HD-Voice service, which ensures a significant increase of the quality and flawless transmission of voice. With a large network of over 7000 base stations, covering 93% of the country’s territory, Nar provides more than 2.1 million subscribers with the highest quality services.